The decisions that you make now have long-term effects in all things, both for yourself and others. There will always come a time where you will be judged. 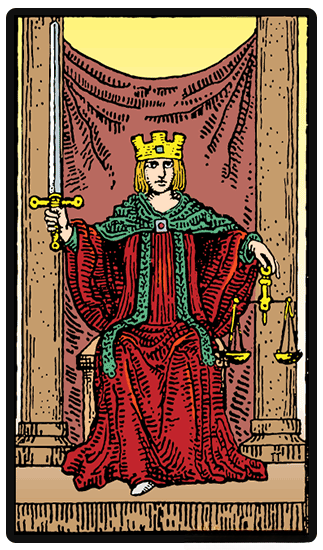 The Justice tarot card appearing in a reading signals that a judgment will be made fairly and accordingly. The decisions that you have made in the past will be carefully weighed with fairness. Your feelings around this card may differ depending on your situation. If you have been wronged, this card's appearance may bring you relief. On the other hand, if your actions caused pain to others, this card serves as a warning. Her appearance represents a chance for you to change your actions now for a better future. When a tarot card reading shows the figure of justice, it is time to account for your actions. If you have been wronged, this card's appearance may bring you relief. On the other hand, if your actions caused pain to others, this card serves as a warning. Another meaning of the Justice card is truth. Truth must come to pass, and this cannot be found from the mouths and gossip of others. Instead, it's based on facts. Learn the truth about others and yourself, speak and know the truth before passing a judgment. During a reading, when you see the Justice Tarot card, you need to be fair in all your deeds. By following the right procedure to learn the truth, you will understand what your tasks are. Another meaning of Justice Tarot card during a reading is to symbolize that attention is needed. It could be about your life, career or just an important decision that you need to make. If you have been unsure about something, it is time to get a solution once and for all. A reversed Justice tarot card could indicate various things. One Justice reversal meaning is to show you are living in denial. You are not willing to accept the consequences of your actions or others. You are running from your guilt. You must however, be aware that these are actions that are in the past. Your future depends on your actions today - and what you will do to tip the scales in balance again. How can you make up for your wrongs? Taking action gives you a chance to change and stop judging yourself. In legal matters, this could represent an unfair outcome of a case that you will not accept.